For over 100 years, KODIAK® has been Canada's Boot and is considered the ambassador from the first nation of winter. They believe in hard work and good times and providing the best in outdoor footwear. KODIAK’s snow and winter boots protect you from fierce weather conditions with its top-notch technology including Thinsulate® insulation, REPEL-X waterproof protection, and Arctic Grip™ slip-resistant outsole. This reliable protection allows you to move confidently and comfortably throughout your day even when the weather turns cold and wet. KODIAK footwear prides itself on letting you thrive in the great outdoors. 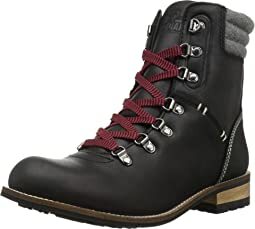 I bought these boots for a June wedding in Alaska where we'll be hiking to the site. I've been wearing them frequently--need minimal breaking in at the ankles. I'm going to get some arch support insoles, but that may just be my foot preference. I wanted boots that would be practical, but also that I could wear with a dress. While hiking! So far they're perfect and I love them. Nice lightweight dress boot that looks good with jeans. After being very pleased with purchase of brown color also bought black. Chose Kodiaks years ago because they were most comfortable over other brands. These seem to be as well. A little concerned over some reviews claiming stitching doesn't hold up but so far so good. Returned these because the inside is very slippery and the width is inconsistent. Some areas were tight, others were super wide. The slippery interior made the inconsistent width a dealbreaker. 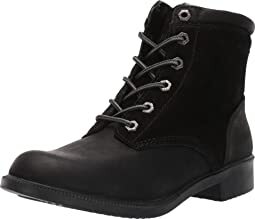 I didn't find these boots comfortable and I think it was in large part because they didn't not have much arch support. Also, while I liked the look of them, the laces were those cheap kind that I hate, the ones that feel a bit stiff and wear and break easily. Had I kept them, I would have bought new (regular) laces for them. Love these! I ordered the black and expected to change out the red laces for the black right away, but turns out, I really like the look of the red laces. 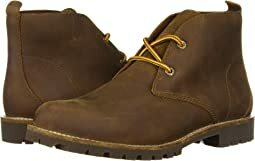 These shoes are a bit more stylish than your typical leather lace up boot and feel sturdy and well made. For the fit: they're slightly tighter than I expected across the toes, but not a deal breaker. I sized up a half size and that was a good choice, I don't think my typical size would have worked. These do fit my half sized orthotic, which helps lessen the tightness across the toes, but I do have a fairly narrow foot so I'm not sure I could say that these definitely accommodate orthotics. Overall, I really like these! They're a great find. This is an awesome boot. It is true to size and width and extremely comfortable right out of the box. 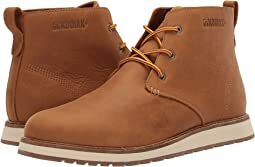 I liked it so much that I went back and bought a brown pair. They are warm and with a warm socks my feet are not cold. Nothing keeps my feet or hands warm but these boots do the trick. Very well made, lightweight yet sturdy. It says they are waterproof but I have not had a chance to try them out in snowy or wet weather. I would imagine they are waterproof because everything else about the boot is true. 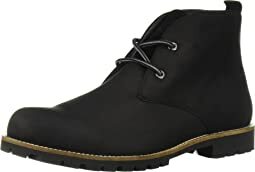 I would highly recommend this boot. I bought these for traveling and light hiking for Scotland. The fit is great and works well with super thick socks. They are stylishish with a purpose and I would highly recommend them. This is a very comfortable boot right out of the box. Fits perfectly too - true to size. I wore them today and my feet stayed warm. 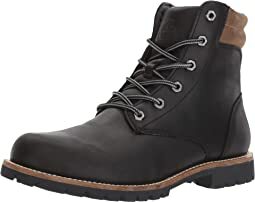 Very fine boot and I would highly recommend it. 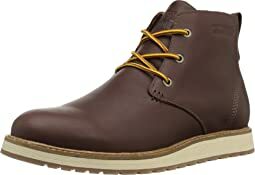 I also purchased the brown boots and will leave a review when I receive them. 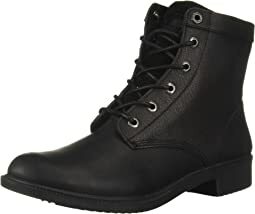 Overall, very pleased with this boot, the leather is nice quality. I would have preferred leather lining to fabric, but it is well made. An aged brass buckle in place of dull gun metal steel would be an enhancement, too. I typically wear size 8 in boots, but sometimes 7.5 or 8.5 depending on brand and style. I ordered the 7.5 in this because 8 was not available at this price, and it fits perfectly with medium weight socks. Only issue is getting it on, a lot of pulling and tugging required to get past the heel cup even with the zipper completely down, but expect that will soften up over time. Well made, really attractive, comfortable out of the box. I love these so much I bought a second pair in black (from another site, though, because Zappos was sold out of my size in that color). These took about one day to break in, but ever since they have been incredibly comfy. 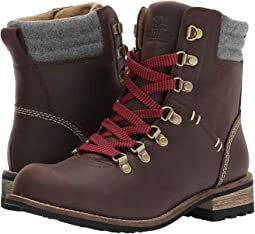 I can wear these to the office and then out in the woods to walk my pup right after work and they remain supportive and just rugged enough to handle a mild trail. I love these boots. 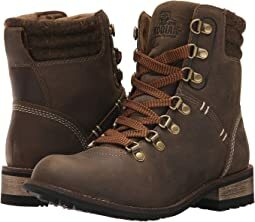 I bought them for a trip to the Midwest in winter and they kept my feet warm and comfortable. 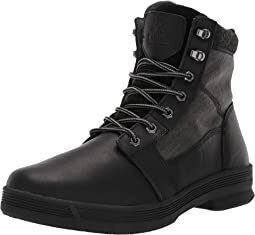 I sometimes have to buy wide width shoes due to a developing bunion on one foot but these have a little extra room in the toe box and the leather is soft which made them comfy right off the bat. I bought my usual size 9 and they were perfect. The black leather is more matte than it looks in the photo and the tongue is suede- I hadn’t noticed this, but I’ve gotten used to it. I love them so much I’ve been wearing them almost ever day from hiking to just hanging out. They are a little bulky but still cute. And they are waterproof! Such a great boot! 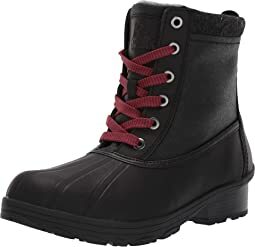 Sturdy and very water-proof after wearing them following a dump of snow. I like that they’re also easy to slip on and take off — not to mention that they’re also cute! So here I was, in the middle of an icy, not particularly snowy, New England winter. 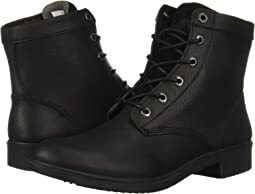 Within two weeks I had taken two major diggers in my all-leather, Vibram soled “engineer boots.” As I was picking myself up off the driveway, I remembered, “oh, yeah, I did this last year, too!” Sigh. 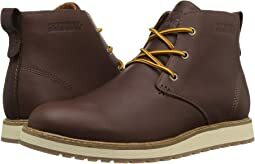 My engineer boots were perfect “mud boots”: no problem walking around in the spring Maine mud season in these hipster work boots but they were leather and slim-ish enough that I could get away with wearing them to work in Boston. In winter, however, they slipped like a banana was stalking me. My Pac snow boots, the Escalade of size, on the other hand, were inappropriate for mere ice. So I searched Zappos. I buy all my shoes on Zappos; all my kids get their shoes from Zappos (they get to see all the colors and pick), and my wife buys her sneakers on Z. We’re fans, okay? 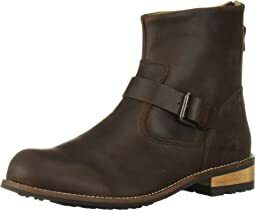 Anyway, to make a long story short, I felt like I’d never find a pair of non-huge leather boots that had soles for ice! Enter Kodiak. Holy cow, these boots are amazing!!! Vibram soles That Are Specifically Made For Ice. A leather upper that doesn’t scream “I am a snow boot!” A customer that won’t fall in the driveway! I normally wear a 9 1/2 in sneakers (let’s call them Schmadidas) and the 9 here was a perfect fit. Nicely insulated but not heavy. My orthotics had plenty of room. And plenty of arch support. (I can’t wear “duck boots” because of the lack of arch support, although those from let’s say El El Frijoles last forever). All-in-all, a well-turned boot. You go, Canada! Thank you, Neighbors to the North, for Ryan Reynolds, Celine Dion, and now...Kodiak. 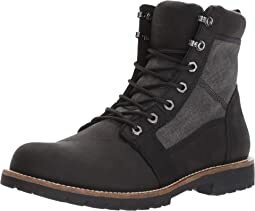 Seriously, people, this is a good boot. Only a few weeks into the purchase but so far i feel like the boots are a quality for price point. The fit is slightly snug .....I ordered a size 9 US. Should have ordered a half size for this thicker socks. Overall will still keep. The style is simple, so I can wear with everything. I recommend shoe. These super cute boots were snug. I usually wear a 7.5 but even without socks they were too tight all around. They are soft on the inside and have a great traction. Will be ordering a half size up in hopes that I can get the right fit. Quality construction. Not a leather that you polish but has a good dull leather finish, nice look. The only 'fit' problem was a bit of heal slippage when walking. I think it comes from the four eyelet style which doesn't keep the heal down as I walked, too bad otherwise really liked the boot. Bought and kept a style that I could polish and with a six eyelet style that keeps my heal from slipping up as I walk. 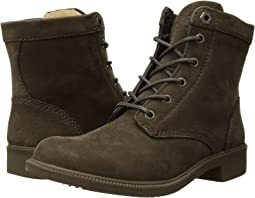 I bought these boots from another store because I receive a big discount. 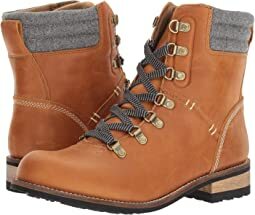 I love these boots- I have feet from hell and have great difficulty finding comfortable shoes/boots for extended periods of walking. For some mysterious reason these boots were the most comfortable boots I’ve ever had. I walked all over France without any discomfort. The width, heel height and arch support were spot on. The heel is flexible and shock resistant. I am going to get another pair so when this pair dies, I’ll have a back-up! I love these boots. I was looking for something warm, that could be worn in the winter weather, but not snow boots. These are incredibly warm and we’re comfortable as soon as I put them on. The lace up style makes them very customizable for fit. And, I ordered black and the red laces really make them pop. Sometimes I order up a half size in a boot, but after reading other reviews I ordered my normal size 8.5 and it fits perfectly with room for thick socks. They are somewhat of a rigid fit, but I like it because they make me feel stable even in the elements! 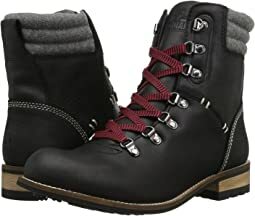 These are adorable - I wore them hiking/ziplining in Costa Rica up in the mountains, where the temps were around the high 60s/low 70s, and they were not too hot. They are very comfortable - I wore them for a whole day brand new without having broken them in ahead of time and did not get any blisters. I don’t normally do reviews but these boots are really exceptional. Extremely comfortable, warm, stylish but not trendy. Really a classic boot. Normally only 1 in 5 pairs of shoes I order work for me. I’m an 8 1/2 and put these on and pretty much only have taken them off to sleep. I liked these boots but they hurt my feet. They were quite stiff, and around the heel I could feel the seam rubbing. With very thick socks the rubbing was tolerable but then they were a little too tight. I wore them while I wrapped a few presents and they got more uncomfortable the longer I had them on. I believe the cushioning underfoot was insufficient.